In the years since this interview took place, Bert Barrott has published a range of books including a wonderful volume of the maps of Edinburgh, with accompanying CD. 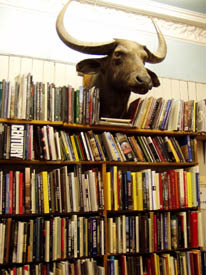 West Port Books has a vast stock and the owner has an equally wide ranging conversational repertoire. These days he often has his head in the clouds – since he got his microlight pilot’s licence. Bert Barrott came to bookselling in West Port Books in Edinburgh by a circuitous route. Seven years of forest administration in Northern Nigeria, three more in Zambia as a Research Officer in sylviculture, then back to Britain to run a smallholding in South Wales with an old friend. Bert opened Bob Cratchit’s Bookshop in Lammas Street, Carmarthen. For the rest of his time in Wales, so many people assumed he was called Bob Cratchit he gave up correcting them. After all, the shop didn’t yield much more than Ebenezer Scrooge paid his clerk. ‘I came to Edinburgh on holiday in August 1978, and while I was browsing in Broughton Books the owner, Ross McLean, happened to remark that the shop was for sale. His price sounded extremely reasonable and on impulse I said, ‘Okay, I’ll buy it.’ I think I surprised myself as much as I surprised him. I went home the next day in a state of shock, and wound things up in Wales. Broughton Books had a very relaxed and unrushed feel, it fitted my vision of a bookshop as something of a refuge at least as much as a place to retail books. 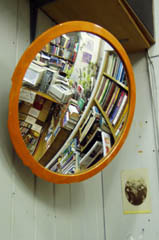 And I enjoy meeting people with individualistic personal attitudes to life, which is just as well, because second-hand bookshops are probably the last refuge for eccentrics in the twentieth century. There aren’t many places left where they can go and meet fellow eccentrics and feel comfortable. Being a bit weird myself helps. I’ll always remember the time an old dear came in, quite a good customer, and as usual she tottered around the shop till she’d found a few books. She brought them over to me at the desk and then said, ‘I hope you don’t mind me bringing him in.’ I looked around. There was no one else in the shop except me and the woman. Maybe I had misheard. And then, ‘He would only be lonely at home you see.’ I thought, there’s something a bit funny here. She said, ‘You don’t mind do you?’ I inquired cautiously, ‘Excuse me, but I don’t know who you are talking about. Who do you mean?’ ‘My pigeon’ she answered. I couldn’t leave it at that. ‘Where is your pigeon?’ ‘Oh,’ she came back, in the long-suffering tones of someone who is forced to state the obvious ‘it’s in my handbag of course.’ And she opens the handbag and out pops this pigeon. About a year later, when Bert was well established in Broughton Books, another shop on a good site came up for sale. ‘Stephanie Pickering was selling West Port Books because she was going abroad. Again on the spur of the moment, I bought it, and asked Peter Galinsky to manage Broughton Books for me while I ran West Port. But it wasn’t long before it became obvious that I was stretched too thin running two bookshops, and Peter took over Broughton Books. ‘When you take over a second-hand bookshop it already has a certain life of its own. It’s an organic entity. You lose some customers and get new ones. Some people can’t stand West Port Books because of the mess. It really is a disorganised shambles. I have to face the fact that it must to some extent reflect the character of the owner. My very own Picture of Dorian Gray. I fondly imagine that I’ll be organised by next Thursday, it’s just that there are a few things on my desk at the moment. At other times I comfort myself with the idea that the unfocussed and unpredictable personality fills a niche in the spectrum of human attributes. We counterbalance the tidy types. Tidy booksellers are able to retrieve things; I have to wait till they pop up. It’s the same with my mind. The shop reflects the style of the customers too, in a way. My music department was tidied up at one period. A lot of people complained. The regular chaos gives the feeling that there might be hidden treasures. Bert admits that the book, printed on green paper, with added illustrations and tipped-in maps on white paper, may have been limited in more ways than one, but no-one complained at the quality of the production and it rapidly sold out. ‘Picturesque Notes on Edinburgh by Robert Louis Stevenson was the next thing I tackled. I think it is probably the best book ever written on Edinburgh. It catches the spirit of the city in a marvellous way. Stevenson is one of my heroes, a beautiful man and a beautiful writer. I printed seven hundred and fifty copies of it, each of which has my fingerprint neatly on one of the plates. Even so, it was slightly better printing than the Barony of Broughton and sold out within weeks. ‘Next was a seventeenth century surgery book, An Explanation of the Fashion and Use of Three and Fifty Instruments of Chirurgery by Helkiah Crooke from Ambrose Paré, 1634, a fascinating book I thought, and very important in the development of surgery. By this time I had moved to West Port and had a better press. The project was a challenge because the original printing was very bad, with a lot of show-through from page to page, and I was working from an atrocious copy. I experimented, and overcame this by varying exposures and getting a very light print. I was pleased with the end result, though it was still a long way from being a professional job. The people who liked it liked it a lot. Unfortunately, there were only six of them. Hope springs eternal. I thought I would be able to retire on my reprint of a lovely 19th century children’s book with line drawings by Ruskin and Kate Greenaway, Dame Wiggins of Lee and her Seven Wonderful Cats. I sold about two copies. By 1987 I realised that I was never going to make the world’s best Master Printer, and so when I published a reprint of Historic Memorials & Reminiscences of Stockbridge, The Dean and Water of Leith by Cumberland Hill I had the printing done by The Moxon Press. I have only about a dozen of the original seven hundred and fifty left in the shop. I still have a few publishing ideas up my sleeve, but they’re for the future. 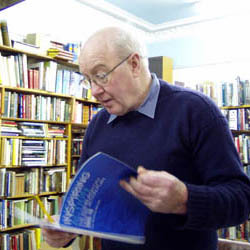 Bert Barrott is still the proprietor of West Port Books 145-7 West Port, Edinburgh, United Kingdom EH3 9DP. 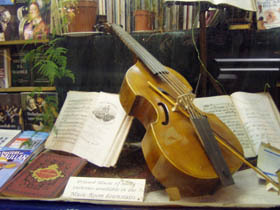 c.25,000 volumes plus a large selection of classical sheet music. Occasional publishing, mainly of Edinburgh History. Stocks many new Indian imprints particularly reprints of classic travels explorations and history in India and the Himalayas and can obtain and supply any Indian title in print. Please enquire.